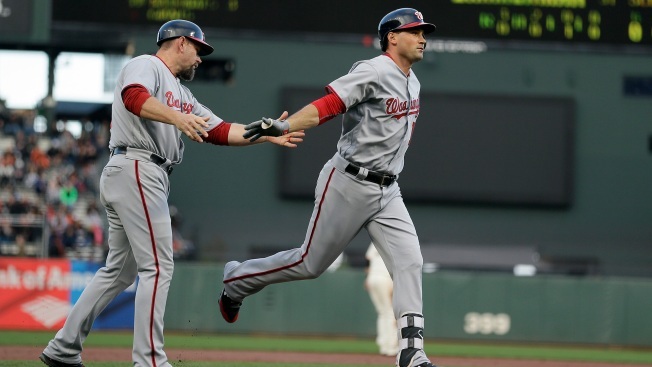 SAN FRANCISCO — As expected, trying to avoid a sweep with Max Scherzer on the other side proved to be a bad idea. Scherzer struck out 11 and went the distance on just 100 pitches, leading the Nationals to a 3-1 win at a very quiet AT&T Park. The Giants lost seven of nine to close out the month, finishing with a 13-16 record in May. They are 11 games under .500. --- The Giants see plenty of Clayton Kershaw, but very little of Scherzer. They’re equally capable of taking control of a game. If it weren’t for a Jayson Werth blunder in left, he would have thrown a Maddux. The double-digit strikeout game was the 54th of his career, the most among active pitchers. --- Jeff Samardzija would be proud of Matt Cain’s escapability. A night after Samardzija stranded plenty, Cain gave up just two earned in five innings despite nine Nationals reaching base. After a three-run homer in the first, he left runners in scoring position in his final four innings of work. --- Brandon Crawford was charged with an error on Trea Turner’s first-inning grounder, but he had some fun when Turner — the second-fastest player in the NL — hit one up the middle in the seventh. Crawford tried to throw Turner out as he rolled over onto his back. The throw didn’t go very far, but the crowd enjoyed it, and on this night there wasn’t much for the crowd to cheer. --- Bruce Bochy said he had no hesitation about using Hunter Strickland, who is still waiting for MLB to rule on his appeal. Strickland pitched the eighth and walked one in a scoreless inning. It was likely his last appearance for about a week; the Giants expect Strickland’s punishment to be finalized before this weekend. --- Down in San Jose, Hunter Pence had a single and walk in five innings of his first rehab game. Pence (hamstring) is scheduled to get 15-20 minor league at-bats, but Bochy knows the “I’M READY” text will come far sooner than that.